This is the lesson plan for learning in a month. There is a chart you can print out if you want to use it to keep track of where you are. This is for those who want to learn in one month. Using the Anniversary manual (the little brown one), you can do this. If you need the free online version, please see the Angel Fishy site here. There are some "reading, writing and dictation" exercises at the end. If you choose to do dictation, you can find the transcript in the above link after each unit online (not on the PDF) and record the units for dictation. They have not been recorded as yet. The first part is just reading. You don't even have to write the page with the alphabet on it (this will be reviewed in Lesson 33 for the initials of names). Just read though it. You will start reading and writing with Unit 1. Some lessons are combined to give you 31 days. Lesson 23 & 24 are combined because Lesson 24 gives you phrasing principles and you've been practicing them throughout the book. This is to learn how to make phrases yourself if you choose to. 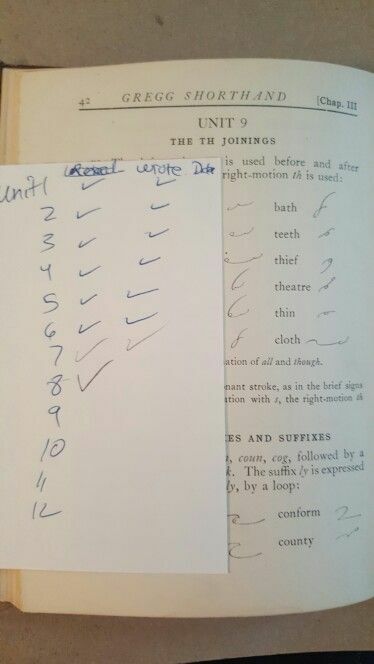 Lessons 28 & 29 are combined as they have word lists and it's good to learn those, but they are shorter. You may need to spend a little extra time on these lessons. Lessons 31 & 32 were word endings. There are a lot of words to review, but since it matches up, I put them together.You may need to spend a little extra time on these lessons. Lessons 33 & 34. Lesson 33 is initials (the shorthand outline) and intersections which you may or may not use to often. Lesson 34 is states and cities which if you don't write much, you can learn as you need them. Lessons 35 & 36 are combined to give you all the lessons in a month. These two lessons are a "short vocabulary" for additional outlines to learn. No new theory is taught. If you want, a simple log will do for this short learning session. Use the lesson plan above or below. Also, you may not have time to write every outline (please try your best, at least every other lesson if not every lesson). So practice reading them and memorizing as much as you can (90%). You can use a card to cover up the longhand and read the shorthand outline. In case you can't get the PDF or want to just come on here to see where you are each day. You can also add your own log here: greggshorthand.proboards.com/board/15/assignment-lesson-logs Then save the link to your personal lesson log. Of course, I forgot to add TRANSCRIPTION. You may wish to change or add transcription. Transcription is where you type up what you've written in shorthand. This allows you to double check your shorthand outlines. My suggestion would be to replace every other day with transcription, unless you are forgoing dictation (because you just want to learn to write it this month), then transcribe everyday. There's an Anni - General Discussion thread ( greggshorthand.proboards.com/thread/431/anni-general-discussion?page=1&scrollTo=6313 ) and it would be great to have those participating check in every now and then. I would like to see that people are participating. It will motivate me to keep "teaching" the class. There's also a Q&A board ( greggshorthand.proboards.com/board/20/shorthand-talk ). This will allow you to ask questions that others who know can answer, plus it's good for future reference as needed. Definitely excited to start! Thank you for doing this! Anyone want to share one that they've made and have been using?